Sales process: A structured approach to closing sales faster! There’s one thing that is true about a job in B2B sales – it’s never boring. In fact, a lot of people choose to work in sales because they think it will give them more freedom and less structure. And they are not wrong! Working in sales gives you a certain degree of independence in how you go about your daily duties. As a sales rep, you need to be flexible and willing to improvise to get that desirable “It’s a deal!” from prospects. Yet, another “fun” part in sales lies in the fact that buyers can be rather picky, overly cautious, impulsive and even suspicious! That is why salespeople need to be creative and often adjust their sales techniques to a potential customer’s needs and sometimes – whims. So, how can something as unstable as this work under a structured plan, you say? Well, this is what this article is going to do – prove that, despite all, you need a formal sales process, because it will make your work more effective, improve performance, and even help you close sales quicker. 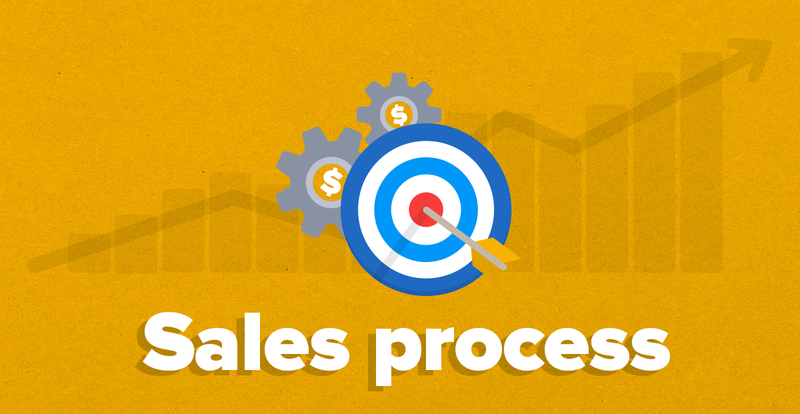 A sales process is a set of repeatable steps that a sales person takes to take a prospective buyer from the early stage of awareness to a closed sale. Simply put, it is a potential customer’s journey from realizing they have a need for a product to making an actual purchase. And since the sales process is a journey for a prospect, it is a roadmap for a sales person. 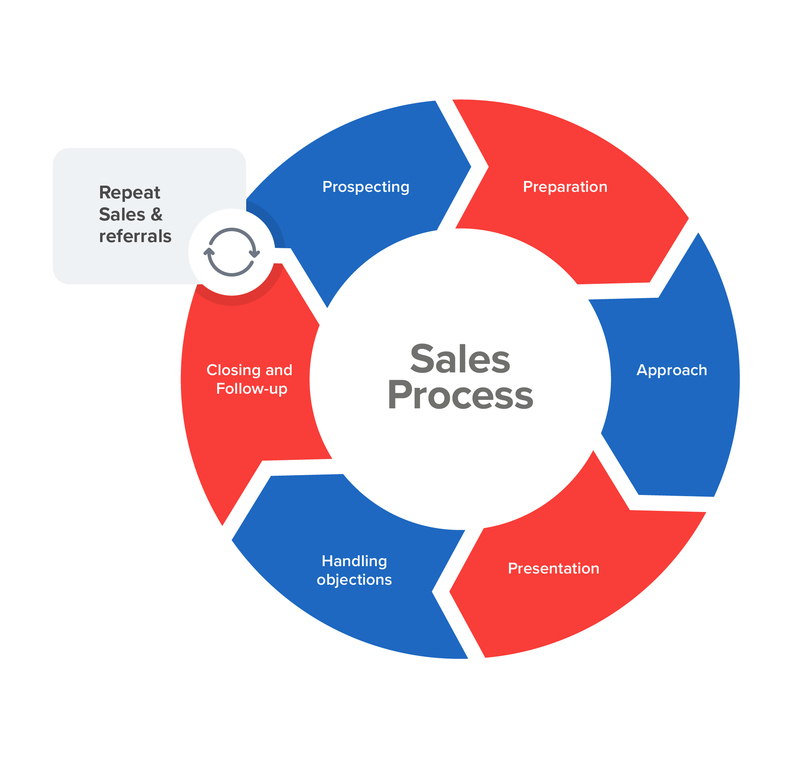 Typically, a sales process consists of 5-7 steps: Prospecting, Preparation, Approach, Presentation, Handling objections, Closing, and Follow-up. While most of sales teams are aware that they go through a similar process, not many of them decide to outline and standardize the process, leaving it all up to individual sales reps to decide what steps to take and when. The logic is quite clear: as long as salespeople keep on closing sales and bringing revenue, how they do it – is their own business. But, unless you are a natural-born sales rep, you can significantly benefit from a standardized sales process and improve measuring, forecasting and general management of sales. As the old saying goes, “Sales is a numbers game”. So, let’s look at the numbers, and see why following a defined sales process in business is more than just a good idea. 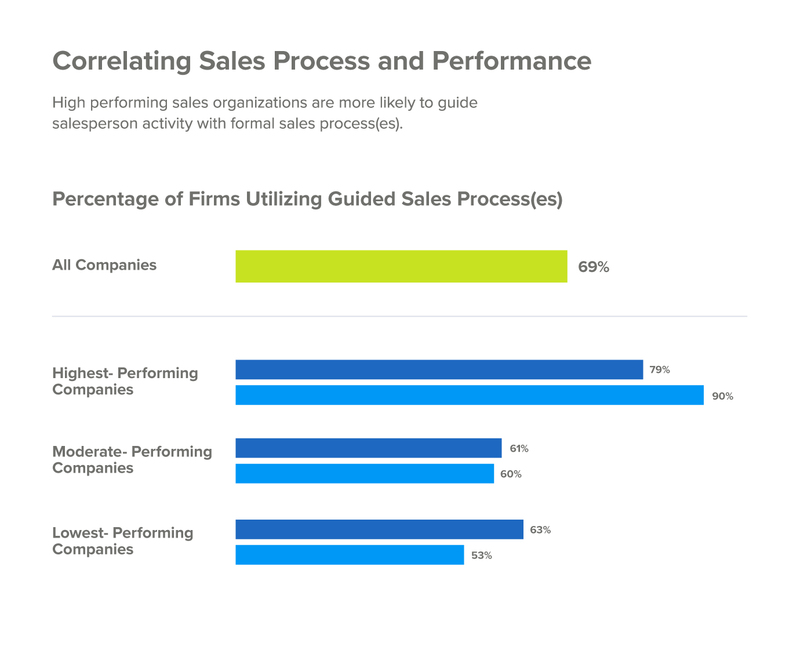 According to a research by the Sales Management Association, 90% of all companies that use a formal, guided sales process were ranked as the highest performing. Studies by TAS Group, Harvard Business Review have also found that companies that implement a sales process outperform companies that do not. The TAS Group, with reference to the Dealmaker Index Study, states that 70% of the companies that follow a structured process in sales are high performers; over 70% of business forecasts were accurate for the companies with a defined sales process. A study by Harvard Business Review (HBR) showed that businesses with a standardized sales process see up to a 28% increase in revenue as compared to those that do not. In another research, HBR reveals that 50% of high-performing sales organizations admit having “closely monitored, strictly enforced or automated” sales processes. Meanwhile, 48% of under-performing organizations have non-existent or informal sales processes. What these numbers show is that three main sales parameters – revenue, performance and forecasting accuracy – tend to go significantly up when a company adopts a standardized sale process. Yet, according to the Objective Management Group, a whopping 68% of all salespeople do not follow a sales process at all! So, it’s fair to say that more companies could do better at sales process management. Of course, relying on your talents and resourcefulness is a cool way to work, but sales is not a game of intuition and creativity. Sales is a structured set of tactical steps. So, let’s talk about the reasons you need a standardized sales process. 1. Get rid of waste. Having a defined process of specific chain-effect steps gives you a more accurate understanding of what things are and aren’t working in your sales. Defining what triggers (actions) cause prospects to move from one stage to the next makes it easy for you to identify the RIGHT actions and get rid of bottlenecks and those activities that yield no or little results. 2. Always stay on course. A sales process is often called a “sales rep’s roadmap”. Following a roadmap does not mean that a sales person will be instructed “do this, then do that”. Instead, a sales process will serve as a GPS system with clear steps and milestones. Knowing what each step entails, helps sales people to understand where they are in the process, when it’s time to move to the next step and when to adjust your course. 3. Utilize your sales talents in every step. Having a sales process does not cancel creativity! You can use your gut instincts and creative talents to get from one stage to the next, as the sales process won’t dictate how to sell on social media, how to structure your sales pitch, what to write in a sales email, or how to draft in a proposal – that’s up to your sales talent and skills! 4. Step into your customer’s shoes. Often companies create a sale process that reflects the way they want to sell, not the way their customers want to buy. What are my main customer groups? How do they differ in terms of their buying patterns? How differently do I sell to new customers and for repeat business? What are my customers’ expectations in each sales stage and what can I do to meet them? 5. Find the cause of stalled sales. Adopting a sales process allows sales professionals to be able to identify the root cause of stalled sales. By following a set of steps, you are able to analyze whether or not your actions were sufficient, how many of them you actually needed, and what proved to be a misstep or a waste of time. This means that if you work with a sales process you can tell not only what was and wasn’t achieved; but also, how it was or wasn’t achieved. 6. Get more qualified leads. Adopting a clearly defined sales process will help your sales team to tackle its biggest pain – filter out low-potential leads and identify the prospects with biggest likelihood to purchase. Making your sales cycle shorter and more targeted, a sales process helps your sales team to maximize their efforts with quality leads. 7. Improve forecasting and revenue. Having a clear picture of where your sales people are in the sales process helps sales managers to come up with more accurate sales forecasting. Since a sales process is a set of repeatable steps, it gives a more consistent picture of how many deals your team closes from a given number of leads. This allows you to predict your win rates and set quotas with more accuracy. 8. Never miss a follow-up. One of the most important aspects of winning a sale is a timely follow-up email. During a (often lengthy) sales interaction, sales reps may forget to follow up with potential customers. This alone may send an entire sale down the drain. Follow-ups keep the desire to buy alive. A standardized sales process will always remind you when to follow up with a prospect and keep a healthy sales pipeline. It can even offer a type of a follow-up activity and even a template to use. 9. Offer better customer experience. Often a sales rep pushes a customer too quickly into the next stages of a sale, for which they may not be ready yet. This can not only damage the relationship, but simply break the deal. A well-designed sales process, that focuses on the customer, can turn a haphazard and often pushy sale into a smooth sailing customer experience. Based on your customer’s buying behaviors and expectations, a sales process will offer the steps that sell value, enhance trust and create a stronger bond with a potential customer – all at the right time. 10. Onboard sales rookies with ease. If, instead of proper training, your new sales people are asked to shadow (watch) their colleagues sell, then you definitely need a sales process! A defined sales process makes it easy to train rookies and coach your sales team. Not only will it offer concrete sales steps for them to follow, but it will also highlight what behaviors and skills are required for each stage of a sale, what outcomes are expected at each step, and what individual strengths should be utilized at different sale stages. A defined sales process can help you do the right things right and know for sure what works and what doesn’t. Equipped with this knowledge you can avoid making the same mistakes. The long-term advantages of adopting a well-tuned sales process are plenty. For a sales manager, following a standardized sales process creates a possibility to concentrate on the things that matter most: planning, distributing leads, prioritizing tasks, managing your team’s time and work load better, as well as making more accurate sales forecasts. To make sure your team sticks to the process, you need a CRM. A CRM system will automate every sales stage and prompt what actions to take, when to follow up, send information and when to start preparing your sales pitch. CRM allows you to easily program all sales stages, document all communication and move a prospect from one stage to another at the right time. Less work, more sales. What more could you ask for? A good sales process is never set in stone! It needs to be revised and adapted regularly, making sure it reflects the current state of the market, your customers’ changing needs, your team skills, and your business specifics. It should always remain a work in progress. Do you follow a standardized sales process in your company? How many steps do you have? Does having a sales process help you win more deals? Are you using the CRM system to help you move through sales stages? Are there any other benefits of following a defined sales process? P.S. Take your sales process to the next level with our free Sales KPI guide. Hi Zarema, Thanks for sharing you thoughts about the sales process. Really appreciate your efforts. Keep up the good work! This sales process is so good I wish I was a sales rep!